Lac Assal, nicknamed Hell, is the lowest point in Africa. It is also the world's largest salt reserve. As they have done for thousands of years, salt caravans still cross the Danakil Depression between Djibouti and Ethiopia. Camels, led by Afar men and loaded down with salt bricks and crystals and smaller granules to trade, plod across this brutal portion of the Great Rift Valley, the 6,000 kilometers-long trench stretching from northern Syria to Mozambique. The salt comes from Lac Assal (Salt Lake), the lowest point in Africa and, at 155 meters below sea level, the third lowest depression on earth. It is the second most salinated lake in the world, after Don Juan Pond in Antarctica. Volcanoes surround the lake like sentries, like ancient, immovable pillars. One of them, Ardoukoba Volcano, erupted in 1978. The dry winds and relentless sun that scorch the land and sap the air of moisture have earned this region a most forbidding nickname: Hell. In 1937 Edgar Aubert de la Rüe and his wife began the arduous task of mapping Djibouti, or what was then known as French Somaliland. In the region of the Ghoubbet el-Kharab they descended into Lac Assal, into hell. Under the full moon, so as to avoid the blistering sun, they hiked down a corridor carved into the basalt, passing the graves of people who had apparently died of thirst. In 1986 a French magazine recommended that tourists leave Djibouti Town by 5 a.m. in order to reach the lake by 9 a.m. and avoid the 50 degrees Celsius springtime temperatures. The same magazine offered two pieces of advice: 1) not to drive on the salt crust and 2) to avoid swimming because there is no water to rinse off the salt afterwards. When my family visits the lake, which on newer roads now takes less than two hours to reach, we drive on the salt crust (and give the Jeep a thorough washing upon returning home), swim in the lake (it is almost impossible to stand, the salt makes the body so buoyant) and bring our own jugs of water for washing. Expatriate life in Djibouti is filled with hills and valleys, Ardoukoba volcano peaks and Danakil depressions. Some days, Lac Assal looks like the minty, vapor-fringed bowl of ink described in the newer tour guides. Other days, when I want to cry from homesickness and the lake is a graveyard of salt-encrusted cattle ribs and bird carcasses, the region does indeed call to mind the devil’s lair. We first visited Lac Assal the day after Christmas in 2004, two years after we had left Minnesota. Two years since we had seen snow or felt cold. My husband, Tom, turned the air conditioner in the Land Cruiser on high, said, “Pretend its snow,” and spun circles on the salt crust while our three-year old twins squealed from the back seat. But when we climbed out of the car, heat blasted away all memories of a snowy Minnesota holiday. The kids cried after they dipped their fingers in the lake and then touched their eyes. While tourists swim and snap photos around the lake, the Afar camel herders begin their trek to Ethiopia. “Faite pisser vos chameux,” they shout the traditional call to start the day, Make your camels piss! Bricks are the simplest form in which to extract and transport the salt, but Lac Assal is also known for its rare salt balls, or Afar Salt Pearls. Salt bricks are carved from the crusty shore. Salt balls are found beneath the honey-thick water of the lake. 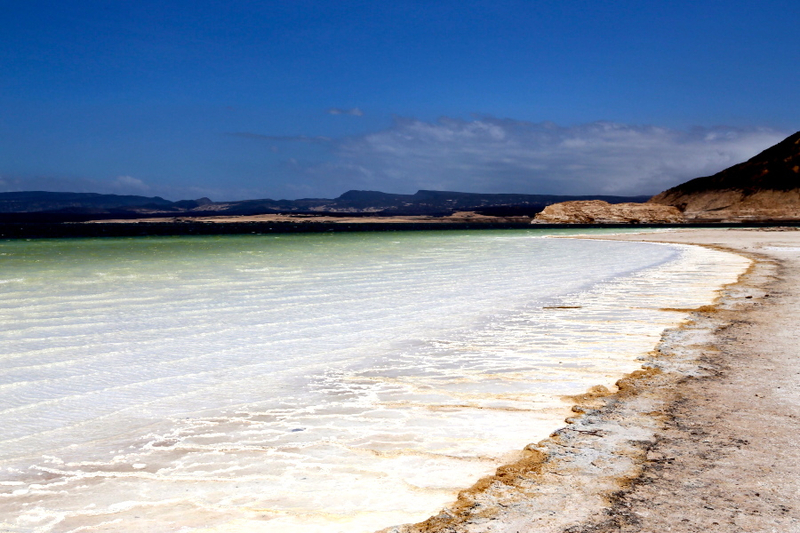 Ever since the French established a presence in Djibouti in March of 1862, there has been interest in developing the production and exportation of salt bricks and slabs from Lac Assal, the world’s largest salt reserve. French explorers hoped to become rich. French diplomats hoped to gain power. France hoped to win out over Britain and Italy in colonial advancement in the Horn of Africa. The only natural resource was salt, white gold. In 1887 a concession signed between local sultans and two French men, Leon Chefneux and Robert Bonnet, gave the foreigners the right to trade salt from the lake for the next fifty years. The exception was that the Afar traders maintained control over the salt trade with Ethiopia. After interpersonal disagreements, the arrangement ended. Five years later the project was relaunched but this time the sultans refused the hand the lake over to the French. More than a hundred years after the failed negotiations, salt projects continue to come and go at Lac Assal. Currently a new port at Ghoubbet, with the aim of exporting salt, is under stop-and-go construction. Various international agencies and sovereign governments have participated in talks and development planning for Lac Assal. While governments plan and companies create business arrangements for high tech extraction and export, Afar salters break the lake’s crinkling surface by striking it with a stick. They gather bricks of salt, crystallized by the rapid evaporation in the dry, fire-wind atmosphere of the lake. Cylindrical coffers carry 3-12 kilograms of salt, 120-150 kilograms per camel. The five-week journey takes the Afars through Hamad Ela village, where a salt tax is levied on each camel, to the Afar Ethiopian town of Berahile, where the salt is unloaded and moved by truck to Mekele. From Mekele, the salt is distributed throughout the country. It is used as table salt or added to animal feed. In the past, the salt bricks themselves were used as currency. Now the salt fetches approximately $9 per camel load. In the past the men slung their arms over Kalashnikovs or AK-47s balanced across their shoulders. Since independence from France in 1977, since the ending of the civil war and final peace talks in 2001, since the passage of laws that forbid personal ownership of guns, walking sticks have replaced firearms. They carry no meat. They drink water or sometimes camel milk. They revel in the freedom and beauty of this desolate land. Let the developers debate funding and ownership and the future, let my family continue to bring tourists to the lake. The salt caravans press on, steady and oblivious to international borders and foreign transplants, heading to Ethiopia to trade the white gold from hell. Quotes and dates and some descriptions taken from L’Or Blanc de Djibouti, translated into English by Rachel Pieh Jones.